He Who is not driven to anger easily. The root from which the nAma is derived is rudir - aSru vimocane - to cry, to weep, to roar. rudra means `one who causes others to shed tear' - rodayati iti rudraH. `raudra' means `rudra-like, violent, irascible, wrathful' (SrI Apte's dictionary). Since bhagavAn is not a raudra, He is called a-raudraH. "SantAkAram bhujaga Sayanam padmanAbham sureSam, viSvAdhAram..". Note also that the first trait praised here is His SAnta AkAram - His Peaceful form with a countenance that radiates kindness and warmth. Sri kRshNa datta bhAradvAj explains the nAma as "parama SAnta saumya sundara AkAraH. SrI v.v. rAmAnujan points out that even though bhagavAn is radiating extreme tejas, it does not deflect His devotees even a bit. Because bhagavAn is avApta-sarva- kAman, He is beyond desire, anger, or any action that can cause either of these. Desire leads to action to attain the desired object, and when it is not attained, it leads to anger; or, when the desired object is attained, more of the same is desired, or some other object is desired, and so the cycle goes on. BhagavAn has no desire, hatred, etc., and so He is called a-raudraH. He is called a-raudraH because He has no association with sorrow that arises out of desire, anger, etc. Ananda pURnAtvAt a-raudraH prasanna mUrtiH - He is the embodiment of Perfect Bliss. He Who is bedecked with beautiful ear-rings. (karNikA tAla patram syAt kuNDalam karma veshTanam (amara. 2.103). He Who is appropriately bedecked with celestial ornaments befitting His body and His status. Thus, SrI BhaTTar takes the kuNDala as one representation of all infinite auspicious ornaments. Literally, "One Who is adorned with beautiful ear-rings, the kUNDala-s, is kuNDalee", since bhagavAn is adorned with makara kuNDalam, or ear-rings that are shaped like fish. One Who is adorned with wonderfully splendorous Crown bearing the central diadem of lustrous stone, other head ornaments, ear ornaments, necklaces and other ornaments for the neck, garlands, shoulder-bracelets, bracelets in the hands, SrI vatsa and kaustubha, pearl garlands, waist ornaments, lace clothes, gold waist band, leg ornaments and other precious and innumerable other jewels. ilagu vilagu makara kuNDalattan (8.8.1)- He Who has shining fish-shaped ear ornaments that are dangling back and forth beautifully while shining lustrously. - makaram SEr kuzhai iru pADu ila'ngi ADa - (tiruneDum tANDakam 21 - tiruma'ngai AzhvAr) - With the shining fish-shaped ear pendants dangling from both ears. kuNDalAkAram vapuH asya iti kuNDalee - that which has a coiling body (amara koSa vyAkhyAnam). "The Supreme Deity wears the sA'nkhya and yoga as His two makara kuNDala-s and the whole brahma lokam as His crown". SrI vAsishTha indicates the roots for the nAma as kuDi - dAhe - to burn, or kuDi -rakshaNe - to protect. He uses the uNAdi sUtra 1.104 - kalas-tRpaSca, to add the affix kala (ala) to kuND, that results in `kuNDala'. SrI vAsishTha suggests that this refers to the sun, fire etc. ; since bhagavAn is their Creator, He is kuNDalee. He has the guNa of `kuNDala' - destruction and protection), and so He is kuNDalee. He Who destroys His enemies, is kuNDalee. 908. cakrI - One with the Discus in His arm. The nAma occurs also in Slokam 107 (nAma 995). (nAma 417 - sudarSanaH, is related). He Who has divine weapons also of like nature (in the context of the previous nAma - kuNDalee). BhagavAn is ever armed with the Discus known as sudarSana. The cakra is smeared with the blood of the asura-s who are the sworn enemies of the gods that are His devout servants. The cakra is also adorned with the flames of fire that are shooting out of it. BhagavAn is called cakrI because He has it as one of His weapons". as a reflection of His rakshakattvam. 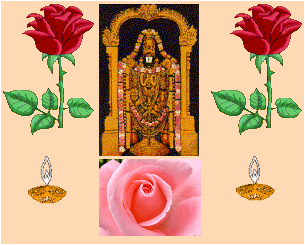 One Whose nature is protection - tiruvAimozhi 2.2.9). exceeding all others in power and force". eppOdum kai kazhalA nEmiyAn nam mEl vinai kaDivAn (periya tiruvantAdi 87). The cakra in His hand serves multiple purposes: It is an adornment for Him; it is also there ever ready to destroy anyone who hurts His devotees. - Azhiyum Sa'ngum SumappAr (tiruvAi. 8.3.3) - He Who carries the Discus and the Conch in His hands. SA'rnga or the bow, Sa'nkha - the Conch, gadA - the mace, khaDga - the sword, and cakra - the Discus). - PadmanAbhan kaiyil Azhi pOl minni valam puri pOl ninRu adirndu - tiruppAvai. - taDavarait tOL cakrapANi - (PeriAzhvAr tirumozhi 5.4.4) - The broad-shouldered One bearing the cakra in His hand. and refers us to nammAzhvAr - (Seru oN Sakkaram Sa'ngu aDaiyALam tirundak kaNDE (tiruvAi. 6.1.7). - sudarSanam cakram asahya tejaH (SrImad bhAga. 8.20.30) - The sudarSana Discus with its intense brilliance. - namaste carka hastAya (VishNu purANam 5.30.22) - Obeisance to Lord with the Discus in His hand. and during His kRshNa incarnation more than once. He holds in His hand the cakra called sudarSana, which represents the principle of manas or mind, for the purpose of protecting all the worlds. "vishNu holds in His hand the cakra which represents the mind that is unsteady, and which is swifter than the wind". The sudarSana cakra in His hand is always rotating and ready to be discharged at anyone who causes obstacles to His devotee, and so it is equated to being `unsteady' in this translation. - samsAra cakram asya A~jnayA parivartata iti vA.
cakate hanti parabalam iti cakram (amarakoSa vyAkhyAnam). cakram aparimitam sainyam asya asti iti cakrI - He Who has an unlimited army at His disposal is cakrI. a) He Who has prowess. b) He with the characteristic stride (in His tri- vikrama incarnation). c) He Who has no difference in His different incarnations. d) He Who has a distinguishing role - that of protection. We had this nAma in Slokam 9 (nAma 76). The word `vikrama' means 'valor', as well as `a pace, stride' (SrI Apte's dictionary). icchA pratihantR prasakti paripanthi svabhAvam (asya iti) vikramI. SrImad SrImushNam ANDavan explains that bhagavAn has the `viSesha kramam' that He will eliminate any obstruction to His Will, and so He is called vi-kramI. "O King of vAnara-s! If only I so desire, I can eliminate any of the beings, be it a piSAca (devilish being), asura, yaksha, or rAkshasa, with the tip of My finger". "How You were born, what all You suffered, what miracles You wrought, how You grew up with mischief-s, how you killed Your foes sportively, how You contrived to conduct a battle showing Your deftness in support pf pANDava-s, the many episodes that You enacted that pass one's understanding.."
"To win nappinnai in marriage, You jumped on the seven bulls and slew them. As a boy, You slew bakAsura by splitting open his mouth. who took the form of a wheel in a toy cart, by a mere kick at the wheel". gAmbhIryAnukUla vilAsaH vikramI - He whose actions are fascinating and befitting His heroic nature. I have written all Your heroic leelA-s in my mind without leaving out anything". SrI vAsishTha indicates the derivation of the nAma from the root kram - pAda vikshepe - to walk, to step. He Who has the distinguishing stride is vikramI. He within whose three wide-extended paces all living creatures have their habitation - referring to His trivikrama incarnation. these two being so unique to Him as compared to all other beings, He is called vikramI". which are all used by Him for the benefit of His devotees. "You are the Ocean unto which flow rivers of limitless excellent virtues, all natural to You, and useful for the protection of the devotees. Always remembering with gratitude even a little worship done to You.". SrI velukkuDi kRshNan enjoys the nAma in terms of bhagavAn's act of bestowing His blessings on His devotees without any limit or restraint. BhagavAn bestows His blessings on His devotees without their asking, without any limit, without even thinking that He is bestowing these blessings on the devotee, and without putting any limits or questioning His actions in this respect. He is like an ocean in this respect - the ocean is very deep, immeasurable in its depth or breadth, and contains treasures that cannot be measured. So also, bhagavAn's desire to bestow His blessings on His devotees is immeasurable and unrestrained (vikrama). c) SrI satya sandha tIrtha gives another anubhavam - he interprets the term `krama' as `tAratamya' or `stepwise differences'. kramaH tAratamyam asya asti iti kramI; na kramI vi-kramI sva avatAreshu tAratamya rahita iti vi-kramI. He has all the qualities that are unique to Him as the Supreme Deity in full perfection, and they are in no way diminished just by His assuming the form of a human or a boar etc. "He Who has a distinguishing occupation or function is vikramI" - viSishTaH kramaH vyApAraH vikramaH. As the Lord of all, It is bhagavAn's role to constantly look after His creation, which is His unique concern. SrI vAsishTha derives the term Urjita from the root Urj - bala prANanayoH - to strengthen, to live, and gives the meaning `balavat' or `endowed with strength' to the word "Urjita". He derives the word SasanaH from the root "SAs - anuSishTau - to teach, to inform, to govern, to correct, to advise. Thus `Urjita-SAsanaH" would mean "One Who governs with forceful effectiveness" - balavat anuSAsanam = A~jnAnuvartanam yasya sa UrjitaSAsanaH vishNuH anatikramaNIya niyamaH - He Whose order cannot be transgressed or violated. SrI BhaTTar's interpretation is - viri'nci purandarAdi alanghyA~jnaH Urjita-SAsanaH - He Whose commands cannot be disobeyed even by brahmA, indra, and others. SrI baladeva vidyA bhUshaN gives an essentially similar explanation - vidhi rudrAdi ala'nghya A~jnatvAt Urjita-SAsanaH. In his tiruvASiriyam-3, nammAzhvAr refers to emperumAn as `ANai mei peRa naDAya daivam' - The Lord Whose commands are fulfilled without obstruction (reference by SrI v.v. rAmAnujan). SrI veLukkuDi kRshNan refers us to tirumazhiSai AzhvAr - poru kaDal nIr vaNNan ugaikkumEl, et-tEvar vAlATTum? (nAnmugan tiruvantAdi 38) - Not a single one among all the deities can as much as lift a finger against bhagavAn's Will. "The wind blows out of fear of Him. For fear of Him does the Sun rise. For fear of Him do agni and indra function. Out of fear of Him, does death, the fifth one, run". etasya vA aksharasya praSAsane gArgi gArgi dyAvAprthivyau vidhRte tishThataH |. "yA~jnavalkya said: O gArgi under the mighty rule of this immutable Brahman, the Sun and the moon are held in their positions. Under the mighty rule of this Brahman, heaven and earth in their positions..."
The Lord has said: The Sruti and smRti are My commands. He who overrides them is a violator of Law and My enemy. Such a person, though he may profess to be My devotee, is not a true VaishNava (worshipper of vishNu)". SrI cinmayAnanda asserts the inviolability of bhagavAn's Laws - "It permits no exceptions, accepts no excuses, admits no circumstantial conditions". He Who is beyond words. SrI vAsishTha explains the nAma as "Sabdam atigacchati = vAcam atikramya vartate iti `SabdAtigaH". ananta jihvena anantena, ananta SAkhaiH AmnAyaiH sAkshAt sarsvatyA ca durudAraha mahimA SabdAtigaH. He is One of ananta kalyANa guNa-s - full of infinite auspicious qualities. We note the thousand guNa-s that are extolled by SrI BhIshma in our SrI vishNu sahasra nAma stotram, are just a small collection of examples of His kalyAna guNa- s. AzhvArs sing this aspect of bhagavAn over and over again. "His Power, beauty, quality, splendor, feats, etc., have no end. The tulasi garland around His neck is proof of His overlordship. How can I describe in words what I have enjoyed? If any of you think you can describe His greatness, try it". "You have filled my mind with Your captivating, honey-exuding, watery, kindly lotus eyes. I recall with gleeYour lying in sleep in the middle of the Milky Ocean. Oh My Lord! It is not enough that I have the mental experience; I will not be able to put in all in words here". "Words turn back without being able to describe Him; The mind also cannot reach Him". Sabda pravRtti hetunAm jAtyAdInAm asambhavAt Sabdena vaktum aSakyatvAt SabdAtigaH. "His Supreme Abode transcends speech, and is meditated upon by yogin-s". SrI cinmayAnanda explains that the veda-s only `point to the Truth', but cannot explain, or even define the truth. beyond all that can be gained even through the highest faculties of the finite equipments (mind and intellect). SrI BhaTTar describes nAma-s 912 to 945 that follow, in terms of the gajendra episode (gajendra mokshaNam). 912. Sabda-sahaH - He Who shoulders the burden of the words of cry of distress. The word Sabda is derived from the root Sap - AkroSe - to curse, to wear, to blame, and the use of the uNAdi sUtra 4.97 - SASapibhyAm dadanau - The affix dan comes after the root roots Sap - to curse, with the meaning Sabda - noise. The term saha is derived from the root sah - marshaNe - to forebear. SrI BhaTTar relates the nAma to the cry of help from gajendra; since bhagavAn bears the responsibility of protecting even animals which may incoherently cry for help, He is called Sabda-sahaH - aspashTa SabdAnAm tiraScAmapi Arta-Sabdam ati-bhAramiva sahate iti Sabda- sahaH. Arta refers to one who is in distress or pain. BhAratvena sahati iti sahaH - He treats the cry for help from the Arta just like carrying a major responsibility or load. When bhagavAn heard the cry of gajendra for help, the cry of "AdimUlam", it immediately evoked a sense or urgency on the part of bhagavAn to help the wounded animal, and He left SrI vaikunTham in a very great hurry to help gajendra. BhagavAn noted that that the elephant had a flower in its hand, and He pondered over its devotion, and this was enough for Him to consider it a major responsibility of His to immediately rush to protect the elephant. `Sabdam' can refer to both good and bad words. SrI vAsishTha takes the word here to refer to `abusive words', and explains that the nAma signifies that bhagavAn puts up with even abusive words from His enemies, because He is full of patience - kshamA vibhUshA sakalasya loke, sarvam kshamAvAn sahate kshmAyAm. So his interpretation is that it is bhagavAn's kshamA or patience that is really spoken of through His nAma `Sabda-sahaH'. Note that Lord rAma is described as kshamayA pRthivI samaH - "In patience, Lord rAma is like Mother Earth". SrI vAsishTha notes that this same guNa transfers to those who are worshippers of Lord vishNu - they are kshamA-vAn-s, those endowed with a predominance of sAttvic tendency. SrI satya sandha tIrtha gives the example of bhagavAn putting up with the insults of Sage bhRgu - bhRgvAdi bhakta kRta tarjana rUpa Sabdam sahata iti Sabda-sahaH. SrI Sa'nkara interprets the nAma as - sarve vedAH tAtparyeNa tameva vadanti iti Sabda-sahaH - He Whom alone all the veda-s proclaim, with single focus. SrI cinmayAnanda explains the nAma as "One Who allows Himself to be invoked by the vedic declarations". He Who rushed to render help. SrI vAsishTha indicates the root for the nAma as SaSa - pluta gatau - to leap, to jump. The word "SiSiraH' is formed by using the uNAdi sUtra 1.53, which states that the word is formed by adding the kirac affix to the root SaSa - to go by leaps. SaSati = Seeghram utplutya gacchati iti SiSiraH. a) SrI BhaTTar interprets the nAma in terms of bhagavAn rushing to the scene where gajendra needed help - Arta Sabda SravaNAntaram ati- tvarayA gataH SiSiraH. SrI BhaTTar quotes the following passage in support, to indicate the speed with which He arrived at the scene where gajendra needed help: SrutvA cakra gadAdharaH, sAnnidhyam kalpayAmAsa tasmin sarasi" - "Immediately on hearing the painful cry of the elephant gajendra, the Lord, armed with His Discus and Mace, flew (on the back of garuDa) and stood on the bank of the pond". Commentators enjoy this incident by pointing out that bhagavAn left without even informing pirATTi, and, when He found that garuDa was not fast enough for His desired speed, He carried garuDa in His hand, and jumped at the scene instantly. "He Who came on garuDa and relieved the misery of the suffering elephant gajendra by releasing the carkrAyudha against the crocodile". - nArAyaNA! O! maNi vaNNa! NAgaNaiyAi! VArAi en iDarai nIkkAi - ena veguNDu tIrAda SIRRattAl SenRu iraNDu kUrAga ErA adanai iDar kaDindAn (SiRiya tirumaDal) - "When gajendra cried for help - O nArAyaNa! MaNi vaNNa! ananta Sayana! Please remove my misery", bhagavAn became very angry at the crocodile, hurried to the scene, split the crocodile into two, and relieved gajendra from his agony. SrI kRshNa datta bhAradvAj also gives an interpretation similar to that of Sri BhaTTar - SaSati -drutam gacchati svajanAnAm avanAya iti SiSiraH - He Who rushes to the protection of His devotees is `SiSiraH'. b) The word SiSirah also means `the cool season'. SrI Sa'nkara uses this meaning, and interprets the nAma as signifying that bhagavAn cools down the tApa-traya-s of His devotees (physical, mental and supernatural) - tApa trayAbhitaptAnAm viSrama sthAnatvAt SiSiraH. The three tApa-s are called AdhyAtmika, Adhibhautika, and Adhidaivika. SrI cinmayAnanda notes that bhagavAn has this nAma indicating that He is the cool resting place for those tortured by the heat of samsAra. SrI vAsishTha uses both the above meanings for "SiSira', namely "one who leaps', and `the cool season', and gives the interpretation that bhagavAn's nAma "SiSiraH' signifies that He is One who supports all the beings by the methodic and regular changing of seasons etc. SrI bala deva vidyA bhUshaN explains the nAma as - dRshTa mAtraH teshAm santApam nivartayati iti SiSiraH - By His very darSanam, all the sorrows of the devotees are washed away, as signified by the nAma SiSiraH. a) He Who had the destructive weapons in His hands. b) The Maker of `night' - in the form of samsAra. c) The maker of night - the time for rest. d) He Who is in the form of the cool rays of the moon in the nights. e) He Who causes destruction of His enemies. a) SrI BhaTTar indicates the derivation of the word `SarvarI' from the root SR - himsAyAm - to tear to pieces, to hurt, to kill, and the application of the uNAdi sUtra 2.122 that results in addition of the affix shvarac to the root SR (SR + shvarac = SarvarI). SrI BhaTTar interprets the word `karaH' as "One with the weapons in His hands" (kara - hand). Some of the other interpreters use the meaning "He Who does" for the word `karaH', based on the root - kR - karaNe - to do. SrI BhaTTar continues his interpretation in terms of the gajendra moksham incident - himsA para vidAriNI pa'ncAyudhI kare asya iti SarvarI-karaH - He Who had the five destructive weapons in His hands, when He came to help gajendra. BhagavAn has the five weapons - Sa'nkha, cakra, gadA (the mace), Sar'nga (the bow), and nandaka (the sword) in His hands, ready to destroy the enemies who are a source of harm to others. "What is night for all beings (i.e., lacking in knowledge of the self), in it the controlled one is awake; when all beings are awake (i.e., involved in the enjoyment of sense objects), that is the night to the sage who sees". (That understanding which has the self for its object, is obscure like night to most. But he who has subdued the senses and is serene, is awake in respect of the self). c) SrI rAdhAkRshNa SAstri comments that the daytime reflects rajo guNa or activity, and the nighttime reflects tamo guNa or inactivity. In this nighttime, the feeling of "I", "mine" etc., are not dominant in our lives. This alternation of day and night is a great help from nature for our lives in this world. The `night' allows us to rest, and forget all the worldly worries. The j~nAnI enjoys the calm of the night even while he is awake. But the aj~nAnI is given the chance to rest by bhagavAn blessing him with the `night' time to rest. So bhagavAn is "SarvarI-karaH" by giving the time of rest - the night for all of us. SrI kRshNa datta bhAradvAj also gives a similar interpretation - SarvarI niSA loka-viSrAma dAyinI | tasyAH karaH sampAdakaH iti SarvarI-karaH - He Who gives the night which is a time of rest for all the beings. d) A different anubhavam is given by SrI satya sandha tIrtha using the meaning `rays' for the term `karaH', and the meaning `night' for the word `SarvarI' - SarvAyAm = rAtrau, karAH = kiraNA yasya candrArgata rUpeNa iti SarvarI-karaH - He Who is in the form of the cool rays of the moon in the night. e) SrI raghunAtha tIrtha uses the meaning `doer' for the word `karaH', but gives yet another anubhavam: SarvarI = himsA, tAm karoti iti SarvarI-karaH - He Who causes destruction of His enemies.